Chand showed me around Mumbai a bit after our visit to R&H. Our first stop was Toto, a really cool Indian pub in a converted garage. The car lifts are still there and they’ve got a fiat jacked up over the bar. There’s a VW van jacked up on the ther side where the DJ booth is. They spin classic hard rock. We headed over to the Boat Club and had some whisky and seekh kabobs then had dinner at Papa Pancho!. Papa Pancho! is a north indian Punjabi joint. The decorations and colors are Punjabi style. The place is owned by a guy who I’m told is a rather creative advertising guy and the name, Papa Pancho’s is something of a hindi pun by way of cockney rhyming slang. When said fast, Papa Panchos’s sounds kind of like “Papa Banjos'”. 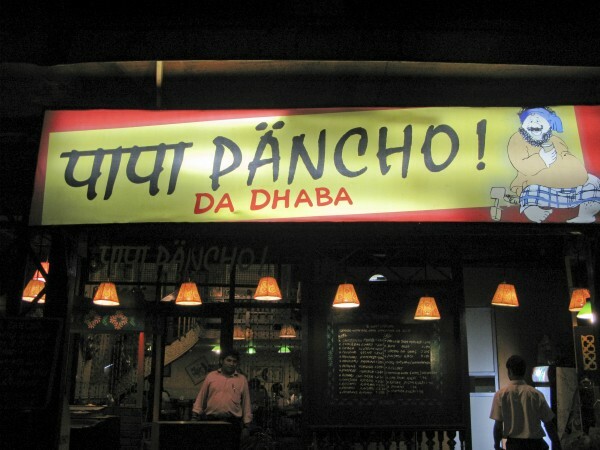 “Bahan” is hindi for “sister” and “cho” is hindi for *ucker so when you tell someone you’re eating at Papa Pancho! it sort of sounds like you’re saying Sister *ucker in hindi.